Many issues have been raised by the demonstration for a People’s Vote on Saturday 23 March. By any account, it was one of the largest political demonstrations in British history, likely rivaling in size the great anti-war demonstration on 15 February 2013. Other than their size, another striking similarity between these two mass demonstrations was the lack of any real official Labour Party support. While in the case of both the invasion of Iraq and the withdrawal from the European Union, the vast majority of Labour members and supporters were firmly opposed, and those active in the campaigns were overwhelmingly natural Labour Party supporters; the Labour leadership was conspicuously absent from the demonstrations. In the case of the Iraq War, this was an imperialist policy driven by the Labour government in power. In the case of the European Union, with the Labour Party in opposition, its absence from the largest mass oppositional demonstration in at least eighteen years is less explicable. Not only was Jeremy Corbyn not present at the demonstration, choosing instead to campaign in Morecambe, almost his entire leadership team was absent. There were, of course, Labour MPs present; most notably the Deputy Leader Tom Watson. This was not, however, as part of any official coordinated effort on the part of Labour. The demonstration was not built through official Labour channels. Organisers, Constituency Labour Parties and branches were not in any way mobilised for the march. In fact, rather than build the demonstration, the Labour Party instead encouraged its members to go out canvassing that Saturday, in what seemed an act calculated to encourage loyalists to stay away. Furthermore, those, such as Tom Watson, who did support the demonstration have been subjected to derision and attacks on the part of some Corbyn supporters. This fits a pattern where opposition to Brexit has come to be seen as a sign of disloyalty to Corbyn and to Labour. Accusations of “Blairism”, “neoliberalism”, and so forth have flown thick and fast. This has been accompanied by vulgar, and frankly embarrassing workerism, with opposition to Brexit being painted as some kind of middle class affectation. It should go without saying that much of the criticism of Corbyn with regards to his attitude towards the European Union has come from the right wing of the party. Some of this could be viewed as purely cynical – the right of the party has made no secret of its opposition to Corbyn’s leadership (just as the left made no secret of its opposition to Blair), and will use any excuse to attack him. 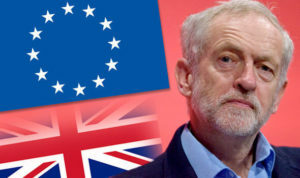 The issue of Europe – where Corbyn is out of step with the majority of Labour members, supporters and voters, including those loyal to him – is an obviously fruitful line of attack. It is also, however, a matter of political principle. The Labour right has always been genuinely committed to the European project, and it should not be beyond the realm of comprehension that they are genuinely appalled by the leadership’s seeming acceptance of Brexit, and its refusal to engage with the People’s Vote campaign in any serious way. This absence from the demonstration has fitted a pattern with regards to the anti-Brexit movement, where Corbyn and the Labour leadership have dragged their feet on taking a clear oppositional stance on the matter. While the Labour Party has shifted slowly towards a position of, perhaps, supporting a People’s Vote, its entire approach since the 2016 referendum result has been one of feet dragging and equivocation. Any argument that it hasn’t been is disingenuous at best. The leadership supported the invocation of Article 50, committed to Brexit in the 2017 general election manifesto, and opposed the People’s Vote policy until it was forced into an ambiguous compromise position by its own loyalists at the 2018 party conference. There are a few reasons for this attitude on the part of the leadership. The first is simply ideological. The left of the Labour Party has traditionally been hostile to the European Union, seeing it as a vehicle for international capitalism. The second is, in a sense, pragmatic. The Labour Party believes that in order to win elections it needs to, in one way or another, keep Leave voters on side, and taking a clear anti-Brexit position would lose it support. I hope to return to both these issues in later posts. There is another reason for the Labour leadership’s approach, which very much shapes its attitude, and the attitude of its supporters, towards the People’s Vote campaign and the anti-Brexit movement as a whole. The Labour Party, throughout its history and continuing to this day, has been marked by suspicion and hostility to any movement outside of its control. It has traditionally viewed any opposition within its own ranks to be the result of hostile outside forces. It has been more concerned with machinations and manoeuvres within its own organisation than with politics outside of it. Any major political development is viewed through the prism of how it might affect the Labour Party – whether it will allow the party to make gains or cause it to incur losses. All other considerations are of secondary importance. This is the attitude of a sect, rather than a movement. Viewed in this light, the Labour leadership’s attitude towards the anti-Brexit movement makes a lot more sense. While the underlying reasons for its policies may be ideological and pragmatic, its thinly veiled suspicion of the movement stems from an organisational culture which long precedes Corbyn’s election to the leadership. Ever since the referendum, Brexit has been derided as a distraction by many within Labour, who argue we should concentrate on Labour’s domestic agenda. Its response to the turmoil that has resulted from May’s failure in the Brexit negotiations has been to demand a new general election, rather than an end to the withdrawal. Opposition to Brexit has been viewed as an act of disloyalty, orchestrated by Blairite traitors within the ranks. It is, however, wrong on the part of some of the leadership’s critics to blame this approach on Corbyn and the left. This attitude has been a feature of the Labour Party since its creation. It has always viewed itself as the one and only true expression of working class interests and progressive politics. Any deviation from the party’s line, any political demand which is not seen to be in the direct interest of the party, any support for a movement which is seen to be in competition with Labour, or just not under its control; is viewed as an act of treachery. This is often presented in quite basic and, on the face of it, pragmatic terms. When in opposition, we are told that our primary concern should be to “get the Tories out”. When in power, of course, our primary concern should be to “keep the Tories out”. Any opposition to the leadership, left or right, risks jeopardising this. These arguments have been used many times in Labour Party history. IN the 1980s, most notably during the Miners’ Strike, industrial militants were warned that strike action would undermine the Labour Party’s attempts to oust Thatcher. The Labour Party’s concern about its electoral hopes were the main factor in stifling the increasingly radical movement against the pit closures in 1992. These movements were at risk of growing outside of the control of the Labour Party leadership, and were therefore treated with suspicion and hostility. They were distractions and indulgences, of secondary importance to the Labour Party’s aim to “get the Tories out”. After the 1997 election victory, opposition to every betrayal of New Labour was accused of jeopardising the Labour Party’s hold on power. Whatever the New Labour government did, up to and including the slaughter of millions of innocent people in Afghanistan and Iraq, we had to “keep the Tories out”. The Labour Party, when all is said and done, is an institution, with its own interests to consider. Its whole existence is predicated upon seeking, gaining and consolidating power. The development of movements outside of its structures risks building alternative centres of power that threaten its own primacy within the working class. The movement against Brexit is considered a threat to the Labour Party precisely because it is not under its control, and because its aims are not seen as serving the leadership’s interests – namely, electing a Labour government. Worse, it is seen (not entirely unreasonably) as a vehicle for the leadership’s opponents. It is a common feature of any sect to view outside political developments that do not directly serve its interests as a threat, perhaps as a result of a conspiracy by dubious outside forces. In this case, the People’s Vote campaign is derided as a middle class movement whipped up by Blairites and other disreputable liberals, aimed at dislodging Corbyn’s socialist leadership. It is undeniable that some of those involved in this campaign are Blairites liberals (some of whom are no doubt disreputable); but to write off an entire mass movement due to the politics of some of its leadership is close to the textbook definition of sectarianism. If the anti-Brexit movement is dominated by opponents of the Labour leadership, it is only because the Labour leadership absented itself from it. If their primary concern is that the movement is being pulled to the right, they would involve themselves in order to pull it leftwards, not ignore it altogether, and abandon its millions of supporters to the “Blairites”. Brexit is one part of a growing international shift towards racist authoritarianism, where the old liberal democratic norms are being undermined and abandoned. Three of the world’s largest liberal democracies – the United States, India and Brazil – have elected far right governments. Right wing populist movements and political parties are sweeping Europe. Any left worthy of that moniker would make opposing and reversing this trend its absolute priority. In Britain, we have been lucky in that, as a right wing racist movement has grown, a left wing counterweight in the form of Corbynism has grown as well. Many of those who we will rely upon to defeat the far right will look to the Labour Party, and to Corbyn, for leadership. 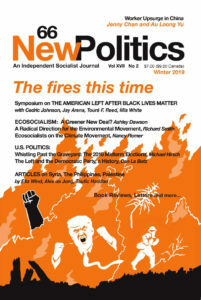 However, if for opportunistic, fractional reasons, opposition to the growth of right authoritarianism is made a lesser priority for the Labour Party gaining power, and furthermore, those who organise themselves independently to do so are isolated and even treated with hostility, we are at risk of falling into old patterns of behaviour, where we ignore or abandon the wider movement for the sake of short term institutional gain. Corbynism would cease to be a movement, and become nothing more than just another Labour leadership demanding our unconditional loyalty and failing to deliver us anything in return. Originally posted at Red Meridian.